Physics is old. Together with astronomy, it’s the oldest scientific discipline. And the age shows. Compared to other scientific areas, physics is a slowly growing field. I learned this from a 2010 paper by Larsen and van Ins. The authors counted the number of publications per scientific areas. 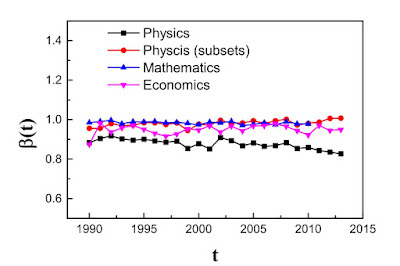 In physics, the number of publications grows at an annual rate of 3.8%. This means it currently takes 18 years for the body of physics literature to double. For comparison, the growth rate for publications in electric engineering and technology is 9% (7.5%) and has a doubling time of 8 years (9.6 years). The total number of scientific papers closely tracks the total number of authors, irrespective of discipline. The relation between the two can be approximately fit by a power law, so that the number of papers is equal to the number of authors to the power of β. But this number, β, turns out to be field-specific, which I learned from a more recent paper: “Allometric Scaling in Scientific Fields” by Dong et al. In mathematics the exponent β is close to one, which means that the number of papers increases linearly with the number of authors. In physics, the exponent is smaller than one, approximately 0.877. And not only this, it has been decreasing in the last ten years or so. This means we are seeing here diminishing returns: More physicists result in a less than proportional growth of output. Figure 2 from Dong et al, Scientometrics 112, 1 (2017) 583.
scales with the number of authors. (1) Physics of black holes, (2) Cosmology, (3) Classical general relativity, (4) Quantum information (5) Matter waves (6) Quantum mechanics (7) Quantum field theory in curved space time (8) general theory and models of magnetic ordering (9) Theories and models of many electron systems (10) Quantum gravity. Isn’t it interesting that this closely matches the fields that tend to attract media attention? Another interesting piece of information that I found in the Dong et al paper is that in all sub-fields the exponent relating the numbers of citations with the number of authors is larger than one, approximately 1.1. This means that on the average the more people work in a sub-field, the more citation they receive. I think this is relevant information for anyone who wants to make sense of citation indices. A third paper that I found very insightful to understand the research dynamics in physics is “A Century of Physics” by Sinatra et al. Among other things, they analyzed the frequency by which sub-fields of physics reference to their own or other sub-fields. The most self-referential sub-fields, they conclude, are nuclear physics and the physics of elementary particles and fields. Papers from these two sub-fields also have by far the lowest expected “ultimate impact” which the authors define as the typical number of citations a paper attracts over its lifetime, where the lifetime is the typical number of years in which the paper attracts citations (see figure below). 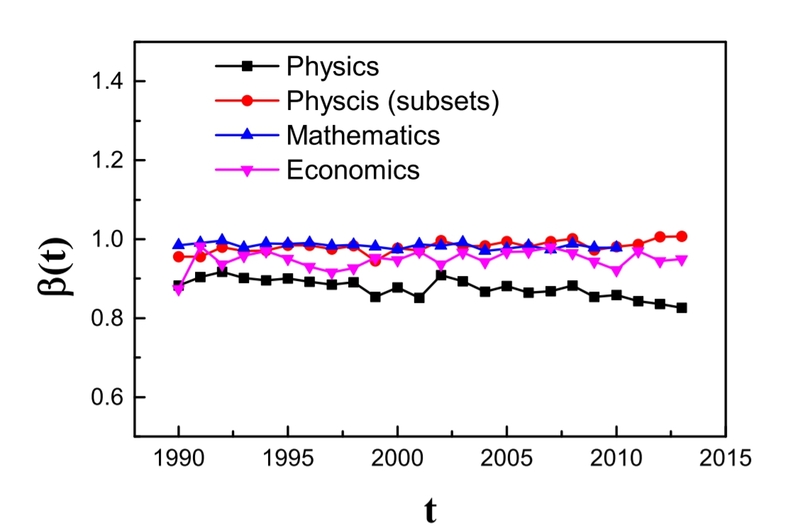 In nuclear physics (labelled NP in figure) and and particle physics (EPF), the interest of papers is short-term and the overall impact remains low. By this measure, the category with the highest impact is electromagnetism, optics, acoustics, heat transfer, classical mechanics and fluid dynamics (labeled EOAHCF). 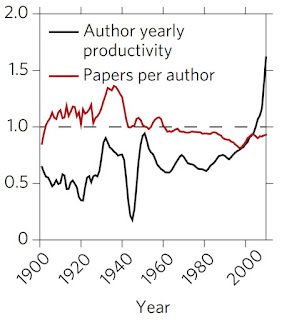 A final graph from the Sinatra et al paper which I want to draw your attention to is the productivity of physicists. As we saw earlier, the total number of papers normalized to the total number of authors is somewhat below 1 and has been falling in the recent decade. 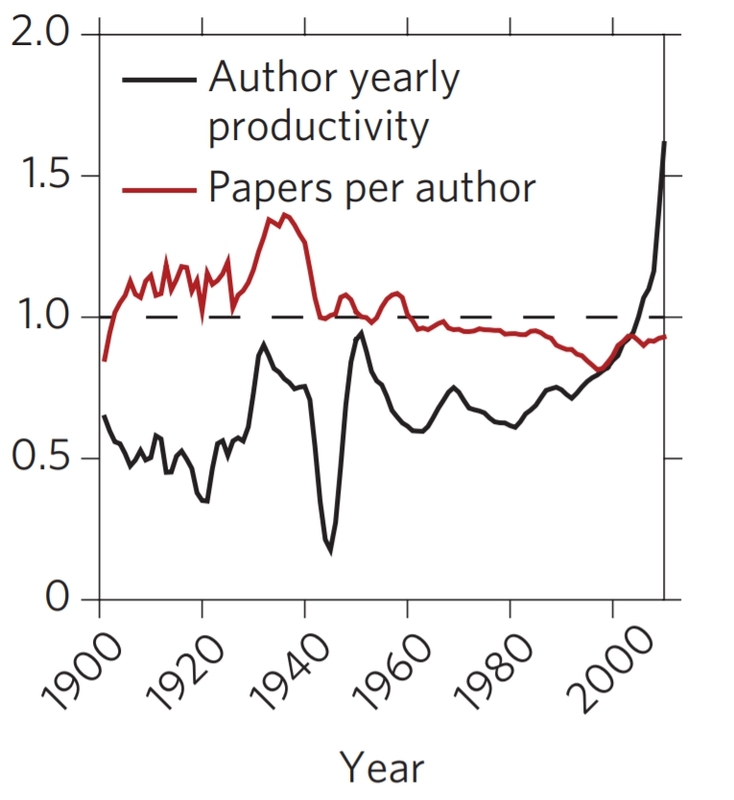 However, if you look at the number of papers per author, you find that it has been sharply rising since the early 1990s, ie, basically ever since there was email. This means that the reason physicists seem so much more productive today than when you were young is that they collaborate more. And maybe it’s not so surprising because there is a strong incentive for that: If you and I both write a paper, we both have one paper. But if we agree to co-author each other’s paper, we’ll both have two. I don’t mean to accuse scientists of deliberate gaming, but it’s obvious that accounting for papers by the number puts single-authors at a disadvantage. So this is what physics is, in 2018. An ageing field that doesn’t want to accept its dwindling relevance. The “multiverse” – the idea that our universe is only one of infinitely many – enjoys some credibility, at least in the weirder corners of theoretical physics. But there are good reasons to be skeptical, and I’m here to tell you all of them. Before we get started, let us be clear what we are talking about because there isn’t only one but multiple multiverses. 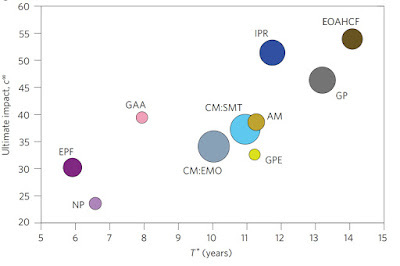 The most commonly discussed ones are: (a) The many worlds interpretation of quantum mechanics, (b) eternal inflation, and (c) the string theory landscape. The many world’s interpretation is, guess what, an interpretation. At least to date, it makes no predictions that differ from other interpretations of quantum mechanics. So it’s up to you whether you believe it. And that’s all I have to say about this. Eternal inflation is an extrapolation of inflation, which is an extrapolation of the concordance model, which is an extrapolation of the present-day universe back in time. Eternal inflation, like inflation, works by inventing a new field (the “inflaton”) that no one has ever seen because we are told it vanished long ago. Eternal inflation is a story about the quantum fluctuations of the now-vanished field and what these fluctuations did to gravity, which no one really knows, but that’s the game. There is little evidence for inflation, and zero evidence for eternal inflation. But there is a huge number of models for both because available data don’t constraint the models much. Consequently, theorists theorize the hell out of it. And the more papers they write about it, the more credible the whole thing looks. 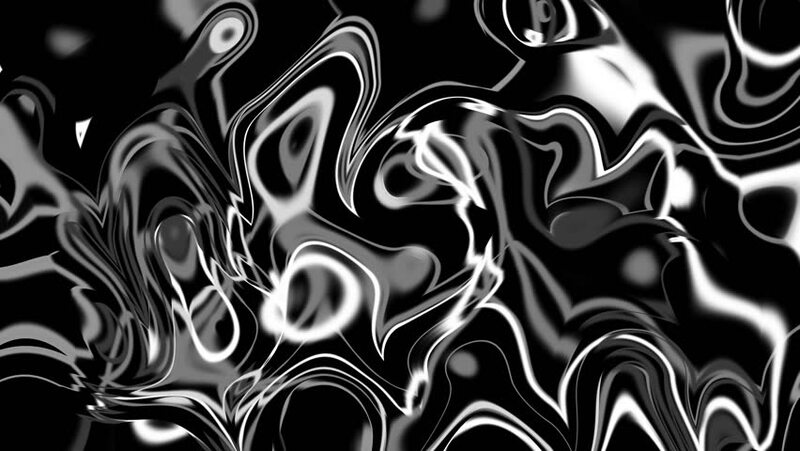 And then there’s the string theory landscape, the graveyard of disappointed hopes. It’s what you get if you refuse to accept that string theory does not predict which particles we observe. String theorists originally hoped that their theory would explain everything. When it became clear that didn’t work, some string theorists declared if they can’t do it then it’s not possible, hence everything that string theory allows must exist – and there’s your multiverse. But you could do the same thing with any other theory if you don’t draw on sufficient observational input to define a concrete model. The landscape, therefore, isn’t so much a prediction of string theory as a consequence of string theorists’ insistence that theirs a theory of everything. There are certain cases in which some version of the multiverse leads to observable predictions. 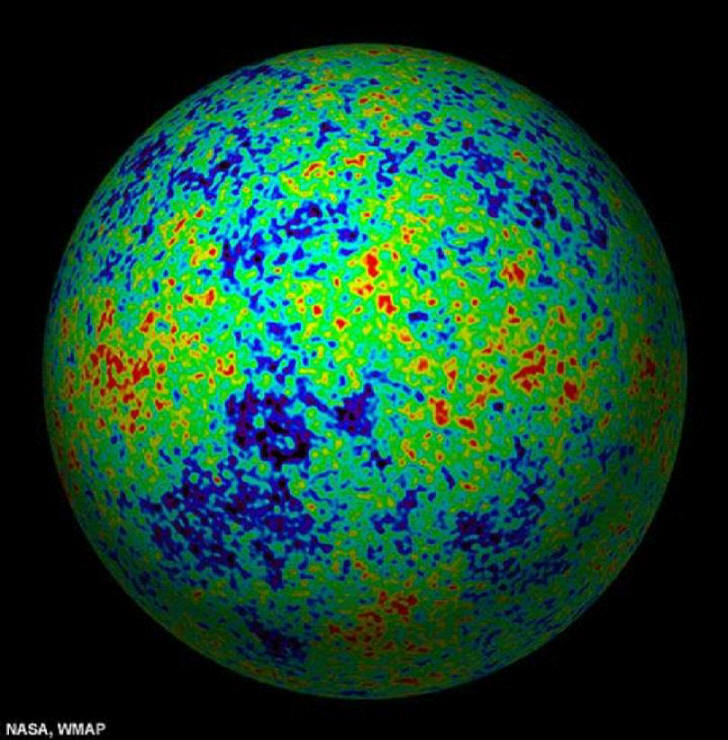 The most commonly named example is that our universe could have collided with another one in the past, which could have left an imprint in the cosmic microwave background. There is no evidence for this, but of course this doesn’t rule out the multiverse. It just means we are unlikely to live in this particular version of the multiverse. But (as I explained here) just because a theory makes falsifiable predictions doesn’t mean it’s scientific. A scientific theory should at least have a plausible chance of being correct. If there are infinitely many ways to fudge a theory so that the alleged prediction is no more, that’s not scientific. This malleability is a problem already with inflation, and extrapolating this to eternal inflation only makes things worse. Lumping the string landscape and/or many worlds on top of doesn’t help parsimony either. So don’t get fooled by this argument, it’s just wrong. 2. Ok, so it’s not falsifiable, but it’s sound logic! I would agree that inflation is a good effective model, but so is approximating the human body as a bag of water, and see how far that gets you making sense of the evening news. But the problem with the claim that logic suffices to deduce what’s real runs deeper than personal attachment to pretty ideas. The much bigger problem which looms here is that scientists mistake the purpose of science. This can nicely be demonstrated by a phrase in Sean Carroll’s recent paper. In defense of the multiverse he writes “Science is about what is true.” But, no, it’s not. Science is about describing what we observe. Science is about what is useful. Mathematics is about what is true. Fact is, the multiverse extrapolates known physics by at least 13 orders of magnitude (in energy) beyond what we have tested and then adds unproved assumptions, like strings and inflatons. That’s not science, that’s math fiction. So don’t buy it. Just because they can calculate something doesn’t mean they describe nature. 3. Ok, then. So it’s neither falsifiable nor sound logic, but it’s still business as usual. The gist of this argument, also represented in Sean Carroll’s recent paper, is that we can assess the multiverse hypothesis just like any other hypothesis, by using Bayesian inference. You would then probably think of people you know and give a lower probability for very large or very small percentages. After that, you could go and look at photos of people from different countries and count the curly-haired fraction, scale this up by population, and update your estimate. In the end you would get reasonably accurate numbers. If you replace words with equations, that’s how Bayesian inference works. You can do pretty much the same for the cosmological constant. Make some guess for the prior, take into account observational constraints, and you will get some estimate for a likely value. Indeed, that’s what Steven Weinberg famously did, and he ended up with a result that wasn’t too badly wrong. Awesome. But just because you can do Bayesian inference doesn’t mean there must be a planet Earth for each fraction of curly-haired people. You don’t need all these different Earths because in a Bayesian assessment the probability represents your state of knowledge, not the distribution of an actual ensemble. Likewise, you don’t need a multiverse to update the likelihood of parameters when taking into account observations. So to the extent that it’s science as usual you don’t need the multiverse. 4. So what? We’ll do it anyway. The fourth, and usually final, line of defense is that if we just assume the multiverse exists, we might learn something, and that could lead to new insights. It’s the good, old Gospel of Serendipity. In practice this means that multiverse proponents insist on interpreting probabilities for parameters as those of an actual ensemble of universes, ie the multiverse. Then they have the problem of where to get the probability distribution from, a thorny issue since the ensemble is infinitely large. This is known as the “measure problem” of the multiverse. To solve the problem, they have to construct a probability distribution, which means they must invent a meta-theory for the landscape. Of course that’s just another turtle in the tower and will not help finding a theory of everything. 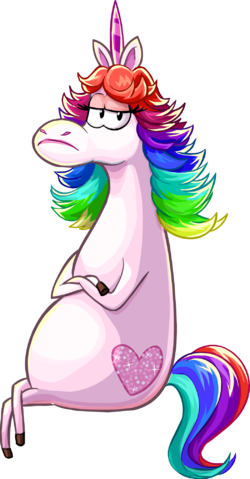 And worse, since there are infinitely many such distributions you better hope they’ll find one that doesn’t need more assumptions than the standard model already has, because if that was so, the multiverse would be shaved off by Occam’s razor. But let us assume the best possible outcome, that they find a measure for the multiverse according to which the parameters of the standard model are likely, and this measure indeed needs fewer assumptions than just postulating the standard model parameters. That would be pretty cool and I would be duly impressed. But even in this case we don’t need the multiverse! All we need is the equation to calculate what’s presumably a maximum of a probability distribution. Thus, again, Occam’s razor should remove the multiverse. You could then of course insist that the multiverse is a possible interpretation, so you are allowed to believe in it. And that’s all fine by me. Believe whatever you want, but don’t confuse it with science. The multiverse and other wild things that physicists believe in are subject of my upcoming book “Lost in Math” which is now available for preorder. It’s a sunny afternoon in July and a grasshopper lands on your lawn. The lawn has an area of a square meter. 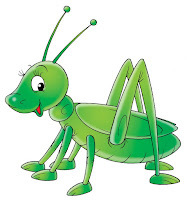 The grasshopper lands at a random place and then jumps 30 centimeters. Which shape must the lawn have so that the grasshopper is most likely to land on the lawn again after jumping? I know, sounds like one of these contrived but irrelevant math problems that no one cares about unless you can get famous solving it. But the answer to this question is more interesting than it seems. And it’s more about physics than it is about math or grasshoppers. No, it’s not round! I learned this from a paper by Olga Goulko and Adrian Kent, which was published in the Proceedings of the Royal Society (arXiv version here). You can of course rotate the lawn around its center without changing the probability of the grasshopper landing on it again. So, the space of all solutions has the symmetry of a disk. But the individual solutions don’t – the symmetry is broken. You might know Adrian Kent from his work on quantum foundations, so how come his sudden interest in landscaping? The reason is that problems similar to this appear in certain types of Bell-inequalities. These inequalities, which are commonly employed to identify truly quantum behavior, often end up being combinatorial problems on the unit sphere. I can just imagine the authors sitting in front of this inequality, thinking, damn, there must be a way to calculate this. As so often, the problem isn’t mathematically difficult to state but dang hard to solve. Indeed, they haven’t been able to derive a solution. In their paper, the authors offer estimates and bounds, but no full solution. Instead what they did (you will love this) is to map the problem back to a physical system. This physical system they configure so that it will settle on the optimal solution (ie optimal lawn-shape) at zero temperature. Then they simulate this system on the computer. Concretely, the simulate the lawn of fixed area by randomly scattering squares over a template space that is much larger than the lawn. 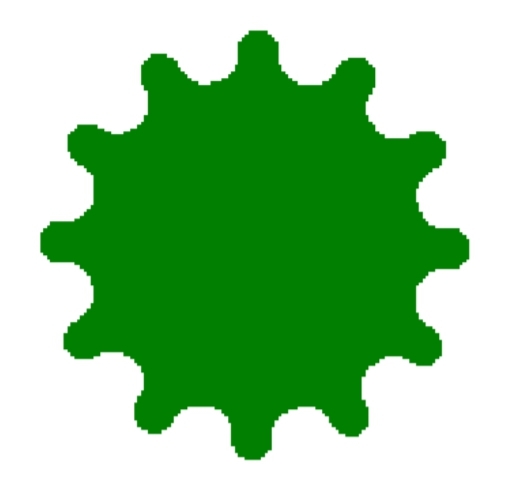 They allow a certain interaction between the little pieces of lawn, and then they calculate the probability for the pieces to move, depending on whether or not such a move will improve the grasshopper’s chance to stay on the green. The lawn is allowed to temporarily go into a less optimal configuration so that it will not get stuck in a local minimum. In the computer simulation, the temperature is then gradually decreased, which means that the lawn freezes and thereby approaches its most optimal configuration. For very small d, the optimal lawn is almost a disc (not shown in the video). 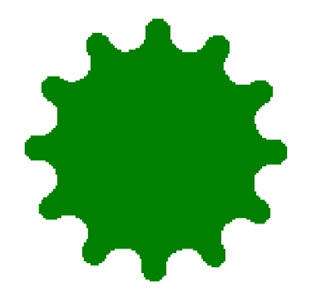 For increasingly larger d, it becomes a cogwheel, where the number of cogs depends on d. If d increases above approximately 0.56 (the inverse square root of π), the lawn starts falling apart into disconnected pieces. There is a transition range in which the lawn doesn’t seem to settle on any particular shape. Beyond 0.65, there comes a shape which they refer to as a “three-bladed fan”, and after that come stripes of varying lengths. The authors did a number of checks to make sure the results aren’t numerical artifacts. For example, they checked that the lawn’s shape doesn’t depend on using a square grid for the simulation. But, no, a hexagonal grid gives the same results. They told me by email they are looking into the question whether the limited resolution might hide that the lawn shapes are actually fractal, but there doesn’t seem to be any indication for that. I find this a super-cute example for how much surprises seemingly dull and simple math problems can harbor! As a bonus, you can get a brief explanation of the paper from the authors themselves in this brief video. 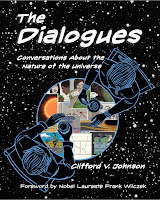 Clifford Johnson is a veteran of the science blogosphere, a long-term survivor, around already when I began blogging and one of the few still at it today. He is professor at the Department of Physics and Astronomy at the University of Southern California (in LA). I had the pleasure of meeting Clifford in 2007. Who’d have thought back then that 10 years later we would both be in the midst of publishing a popular science book? Clifford’s book was published by MIT Press just two months ago. 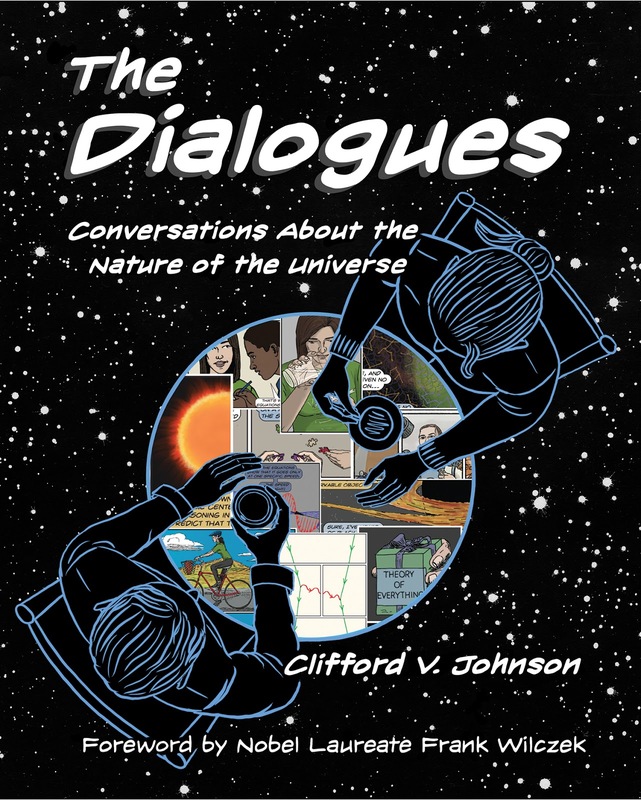 It’s titled The Dialogues: Conversations about the Nature of the Universe and it’s not just a book, it’s a graphic novel! Yes, that’s right. Clifford doesn’t only write, he also draws. His book is a collection of short stories which are mostly physics-themed, but also touch on overarching questions like how does science work or what’s the purpose of basic research to begin with. I would characterize these stories as conversation starters. They are supposed to make you wonder. But just because it contains a lot of pictures doesn’t mean The Dialogues is a shallow book. In contrast, a huge amount of physics is packed into it, from electrodynamics to the multiverse, the cosmological constant, a theory of everything and to gravitational waves. The reader also finds references for further reading in case they wish to learn more. I found the drawings were put to good use and often add to the explanation. The Dialogues is also, I must add, a big book. With more than 200 illustrated pages, it seems to me that offering it for less than $30 is a real bargain! I bought the book when it appeared, but later received a free review copy. Now I have two and I am giving one away for free! The book will go to the first person who submits a comment to this blogpost (not elsewhere) listing 10 songs that use physics-themed phrases in the lyrics (not just in the title). Overly general words (such as “moon” or “light”) or words that are non-physics terms which just happen to have a technical meaning (such as “force” or “power”) don’t count. The time-stamp of your comment will decide who was first, so please do not send your list to me per email. Also, please only make a submission if you are willing to provide me with a mailing address. Beginning 2018, I will no longer write for Ethan Siegel’s Forbes collection “Starts With a Bang.” Instead, I will write a semi-regular column for Quanta Magazine, the first of which -- about asymptotically safe gravity -- appeared yesterday. In contrast to Forbes, Quanta Magazine keeps the copyright, which means that the articles I write for them will not be mirrored on this blog. You actually have to go over to their site to read them. But if you are interested in the foundations of physics, take my word that subscribing to Quanta Magazine is well worth your time, not so much because of me, but because their staff writers have so-far done an awesome job to cover relevant topics without succumbing to hype. I also wrote a review of Jim Baggott’s book “Origins: The Scientific Story of Creation” which appeared in the January issue of Physics World. I much enjoyed Baggott’s writing and promptly bought another one of his books. Physics World doesn’t want me to repost the review in text, but you can read the PDF here. Finally, I wrote a contribution to the proceedings of a philosophy workshop I attended last year. In this paper, I summarize my misgivings with arguments from finetuning. You can now find it on the arXiv. 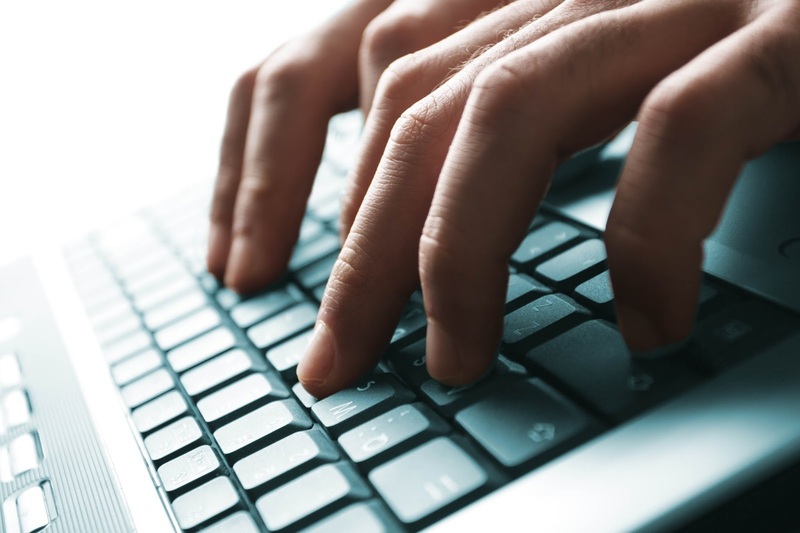 If you want to stay up to date on my writing, follow me on Twitter or on Facebook. Sometimes I believe in string theory. Then I wake up. And I can’t blame them. Because nothing else is happening on this planet. There’s just me and my attempt to convince physicists that beauty isn’t truth. Yes, I know it’s not much of an insight that pretty ideas aren’t always correct. That’s why I objected when my editor suggested I title my book “Why Beauty isn’t Truth.” Because, duh, it’s been said before and if I wanted to be stale I could have written about how we’re all made of stardust, aah-choir, chimes, fade and cut. Nature has no obligation to be pretty, that much is sure. But the truth seems hard to swallow. “Certainly she doesn’t mean that,” they say. Or “She doesn’t know what she’s doing.” Then they explain things to me. Because surely I didn’t mean to say that much of what goes on in the foundations of physics these days is a waste of time, did I? And even if, could I please not do this publicly, because some people have to earn a living from it. They are “good friends,” you see? Good friends who want me to believe what they believe. Because believing has bettered their lives. And certainly I can be fixed! It’s just that I haven’t yet seen the elegance of string theory and supersymmetry. Don’t I know that elegance is a sign of all successful theories? It must be that I haven’t understood how beauty has been such a great guide for physicists in the past. Think of Einstein and Dirac and, erm, there must have been others, right? Or maybe it’s that I haven’t yet grasped that pretty, natural theories are so much better. Except possibly for the cosmological constant, which isn’t pretty. And the Higgs-mass. And, oh yeah, the axion. Almost forgot about that, sorry. But it’s not that I don’t think unified symmetry is a beautiful idea. It’s a shame, really, that we have these three different symmetries in particle physics. It would be so much nicer if we could merge them to one large symmetry. Too bad that the first theories of unification led to the prediction of proton decay and were ruled out. But there are a lot other beautiful unification ideas left to work on. Not all is lost! And it’s not that I don’t think supersymmetry is elegant. It combines two different types of particles and how cool is that? It has candidates for dark matter. It alleviates the problem with the cosmological constant. And it aids gauge coupling unification. Or at least it did until LHC data interfered with our plans to prettify the laws of nature. Dang. And it’s not that I don’t see why string theory is appealing. I once set out to become a string theorist. I do not kid you. I ate my way through textbooks and it was all totally amazing, how much you get out from the rather simple idea that particles shouldn’t be points but strings. Look how much consistency dictates you to construct the theory. And note how neatly it fits with all that we already know. But then I got distracted by a disturbing question: Do we actually have evidence that elegance is a good guide to the laws of nature? The brief answer is no, we have no evidence. The long answer is in my book and, yes, I will mention the-damned-book until everyone is sick of it. The summary is: Beautiful ideas sometimes work, sometimes they don’t. It’s just that many physicists prefer to recall the beautiful ideas which did work. And not only is there no historical evidence that beauty and elegance are good guides to find correct theories, there isn’t even a theory for why that should be so. There’s no reason to think that our sense of beauty has any relevance for discovering new fundamental laws of nature. Sure, if you ask those who believe in string theory and supersymmetry and in grand unification, they will say that of course they know there is no reason to believe a beautiful theory is more likely to be correct. They still work on them anyway. Because what better could they do with their lives? Or with their grants, respectively. And if you work on it, you better believe in it. I consent, not all math is equally beautiful and not all math is equally elegant. I yet have to find anyone, for example, who thinks Loop Quantum Gravity is more beautiful than string theory. And isn’t it interesting that we share this sense of what is and isn’t beautiful? Shouldn’t it mean something that so many theoretical physicists agree beautiful math is better? Shouldn’t it mean something that so many people believe in the existence of an omniscient god? But science isn’t about belief, it’s about facts, so here are the facts: This trust in beauty as a guide, it’s not working. There’s no evidence for grand unification. There’s no evidence for supersymmetry, no evidence for axions, no evidence for moduli, for WIMPs, or for dozens of other particles that were invented to prettify theories which work just fine without them. After decades of search, there’s no evidence for any of these. It’s not working. I know it hurts. But now please wake up. Let me assure you I usually mean what I say and know what I do. Could I be wrong? Of course. Maybe tomorrow we’ll discover supersymmetry. Not all is lost.